Fat around the waist is not only dangerous to your health, but it's also often the most responsive to traditional weight-loss methods. 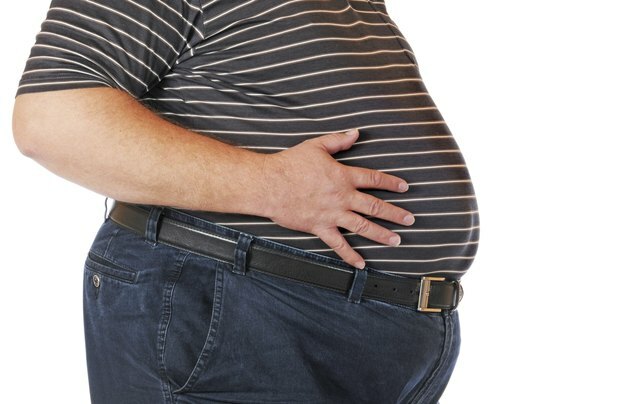 This type of fat, called visceral fat, is biologically active and releases compounds into your body that increase the risk you'll develop type 2 diabetes and cardiovascular disease. With dietary revisions, an increase in physical activity, adequate sleep and a decrease in stress, you can reduce the amount of fat around your middle. Too much of the wrong types of foods contribute to excess belly fat. Revise your diet to focus on healthy, whole foods instead of lots of processed products high in sugar and refined grains. Brown rice, quinoa and barley are superior to white bread, white rice or bakery products. Eat polyunsaturated fats, including safflower oil, fatty fish, walnuts and sunflower seeds, instead of saturated fat found in fatty cuts of meat and full-fat dairy. A study published in a 2014 issue of Diabetes found that a diet rich in saturated fats encouraged visceral fat development, while one high in polyunsaturated fats does not. Rush University Medical Center recommends eliminating all sugary drinks, such as soda and juices, to jump start belly fat loss. These drinks add extra calories and sugar that can increase the amount of belly fat you develop. The Journal of Clinical Investigation published a study in 2009 showing that a large consumption of fructose, which is a primary sweetener in beverages, increases visceral fat. Get a regular seven to eight hours of sleep per night to help prevent fat from developing around your waist. A study in a 2014 issue of Obesity studied almost 300 people for six years and found that those who slept less than six hours per night or more than nine hours per night gained significantly more visceral fat than people who slept between seven and eight hours a night. This confirmed research from a 2010 study in the journal Sleep that showed similar correlations between excess belly fat and too little or too much sleep. Rush University Medical Center notes that the single most important step you can take to reduce belly fat is to become more physically active. Get at least the minimum 30 minutes on most days of moderate-intensity cardiovascular exercise, such as brisk walking. Consider increasing that amount to 60 minutes per day for more greater reductions in belly fat, suggests The Harvard Medical School's Family Health Guide. In addition, strength train to build muscle, which may help enhance your metabolism and fight excessive abdominal fat. Move more every day, too, to help burn calories and keep your body healthy. Don't just sit at a desk job; instead, find creative ways to take short walks to run errands every hour or so, stretch at your desk and do small movements, such as tapping your foot, to slightly boost your calorie burn. Don't rely on abdominal exercises and crunches to stave off belly fat, though. These exercises build strong muscles, but they lay behind any fat you have and don't help you get rid of it. A stressful lifestyle causes cortisol, a hormone, to pump out in excess and this can encourage your body to store abdominal fat, especially when combined with a high-fat, high-sugar diet. Adopting mindfulness programs, such as gentle yoga stretching and meditation, can help reduce stress and curb emotional over-eating that leads to an expanding waist, showed a study in a 2011 issue of the Journal of Obesity. If Eastern approaches to stress reduction don't appeal to you, find alternative ways to reduce stress. Spend quality time with your family and loved ones, take a soothing bath and delegate duties when you can so you feel less overwhelmed. Rush University Medical Center: Is There 'One Trick' to Losing Belly Fat? What Causes Lower Belly Fat?